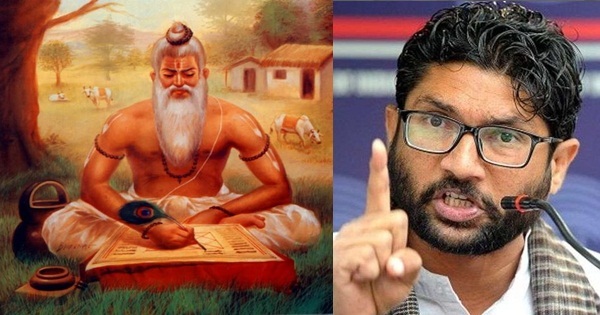 Dalit leader Jignesh Mevani asked in Delhi Rally to choose between Manusmriti and Indian Constitution. I am 100% sure that he and other people like him have never ever read Manusmriti. Boasting aloud is only what they know. I challenge Jignesh Mevani to read this article and then give his opinion about Manusmriti. Let him come and debate on MANUSMRITI. I challenge him for this noble cause. Let the readers decide what they will choose between Indian Constitution and Manusmriti after reading this article. Most of readers might be having opinion about Manusmriti that it supports Caste System. To their opinion it says that a Brahmin is superior to a Shudra. Many will advocate to burn such text opining it supports Caste System. Let us inquire into the common unfavorable perception whether the Manusmriti supports casteism. Swami Dayanand, the great Vedic scholar of the 19th Century, writes: “I believe in that part of Manusmriti which is not interpolated (appended later) and is in accord with the Vedas.” He concludes that the Manusmriti we read today is not as originally laid down by Swayambhu Manu, the first Chief of Humanity. As it now is, he found the text as self-contradictory and against the values espoused in Vedas, and hence injudicious. He therefore rejects those prejudicial texts which advocate discrimination against populations with alleged inferior status. Here are the verses from Manusmriti which says that Varna is based on qualification not on the basis of Birth. 2/28. This (human) body is made fit for (union with) Brahman by study of the Vedas, by vows, by burnt oblations, by (recitation of) sacred texts, by (acquisition of the) threefold sacred science, by offering (to gods, sages and manes), by (procreation of) sons, by great sacrifices, and by (the Srauta) rites. The Varna of a person (caste or status in society) was decided after completion of his education. Two births were considered for a person in Vedic period : first, when he was born to his parents, and, next, when he completed his education with due thoroughness. It was after second birth (twice born) that the Varna of person was determined. The following text from Manusmriti makes it even more clear. A person who remained uneducated and devoid of the knowledge of Vedas was considered a Shudra. That is, the Shudra Varna was not based on birth but on merit. 1/31. But for the sake of the prosperity of the worlds he caused the Brahmana, the Kshatriya, the Vaisya and the Shudra Varna origin in form of the body of the society : as its mouth, its arms, its thighs and its feet, respectively. 1/91. One occupation only the Lord prescribed to the Shudra: to serve these (other) three castes. Manu considered anyone who is without knowledge or capacity for skilled deeds as a Shudra. So any uneducated person is fit only for being in the service, under the guidance, of others who have the requisite knowledge and skills. Isn’t that how we are organised even today? Manu also advises people to exert in order to acquire a higher Varna, and change his or her allotted Varna. The advisory leaves Varn Vyastha changeable, fluid, and not based on birth but on merit alone. 2/103. But he who does not worship in morning, nor in the evening, is like a Shudra and he shall be excluded, just like a Shudra, from all the duties and rights of an Arya (one of noble qualities). In above text Manu gives respect to any Shudra who is in tenth decade of life. That is, anybody who lives long enough transcends the Varna Vyavastha. Householders are advised by Manu to dine after Shudras or the servants ! Manu advises strict punishment for a higher Varna : punishing the Brahmana many times more than a lower Varna, say, a Shudra. The above text is evidence of Manu’s unbiased social hierarchy and structure. He considered a behavioural error as being more unpardonable in case of the learned one than for the ignorant. 1. Rishi Brahma, son Manu Swayambhu himself, was born to a Brahmana but became a Kshatriya king. 2. Manu’s eldest son, Priyavrat, became a king, a Kshatriya. 4. Kavash Ailush was born to a Shudra and attained the highest Varna of a Rishi. He became mantra-drashta to numerous hymns in Rig Veda : 10th Mandal. 5. Jabala’s son, Satyakaam, born from unknown father became Rishi by his qualities. 6. Matang became a Rishi after his birth in low Varna. 7. Maharishi Valmiki was born in inferior Varna and became a Rishi. 8. Mahatma Vidur was born to a Dasi (maid) and became the prime minister to king Dhritarastra. 9. Raja Vishvanath, a Kshatriya, became a Brahmana – Rishi Vishwamitra. 1. Ravan king of Lanka, who was son of a Brahmana Rishi Pultasya, became a Rakshasa. 2. Shri Ram’s ancestor, Raja Raghu’s son, Pravidh, was declared of inferior Varna due to lack of qualities. 3. Shri Ram’s ancestor, Raja Samar’s son, Asmanjas, was declared a Shudra due to his bad qualities. Thus the real Manusmriti supports Varn Vyastha based on Merit not on the basis of Birth. The adulterated part is thus rejectable. Featured image courtesy: Siasat and Punjab Kesari.